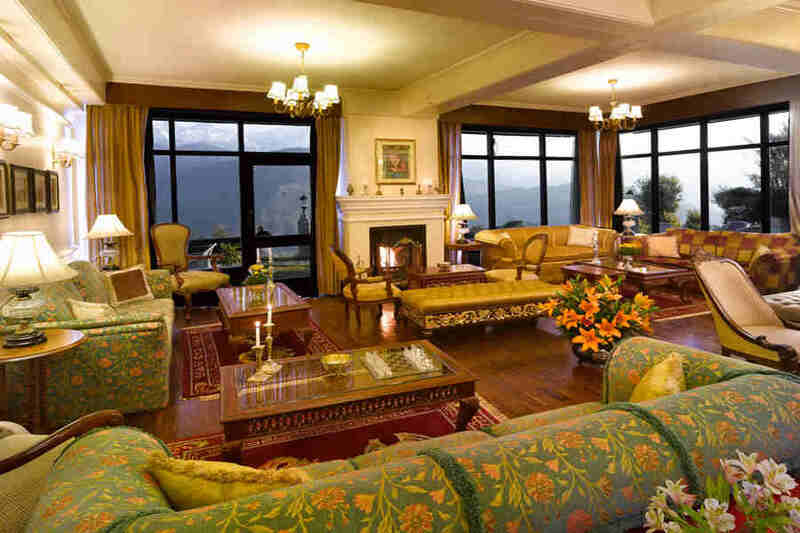 Use the form below to inquire about Classic Mountain Resort at Pelling . Use the form below to reserve for Classic Mountain Resort at Pelling . Submerge yourself in the peace and tranquility of this Classic Mountain Resort at Pelling overlooking the Singalila range. This erstwhile summer party hotspot of the royalty nestles on eight acres of landscaped gardens and virgin forest. 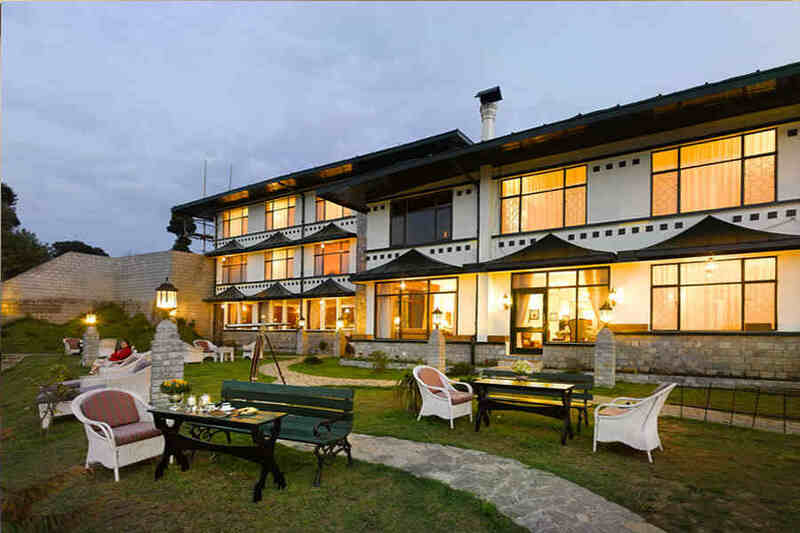 This Classic Mountain Resort at Pelling is quite close to the centuries-old Pemayangtse Monastery. The greenery around the resort is home to a variety of rare avian species including Scimitar Babblers, Laughing Thrushes, Green-tailed Sunbirds, and Rufous-Gorgeted Flycatchers to name a few. 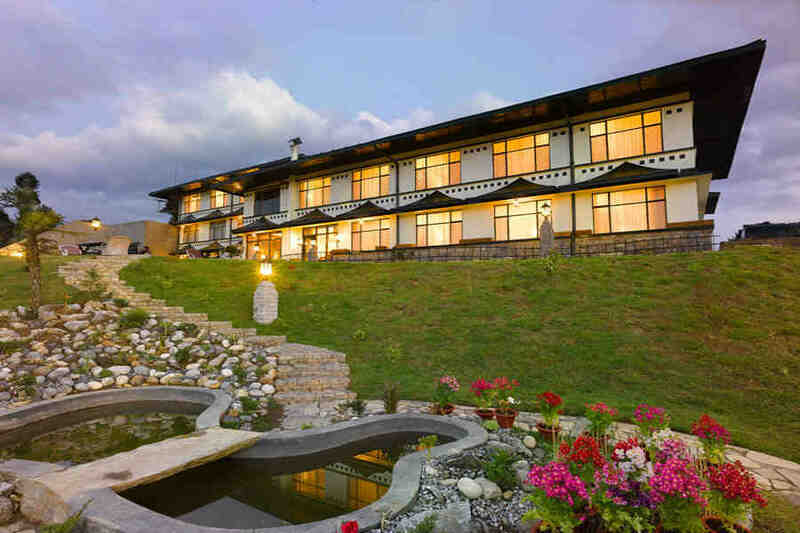 This Classic Mountain Resort at Pelling is built in the Sikkimese style of architecture and features huge glass windows that provide stunning views of the surrounding landscape at all times of day and night. The spacious and tasteful lobby features a traditional fireplace as well as elegant furniture that testifies to the royal past of this structure. 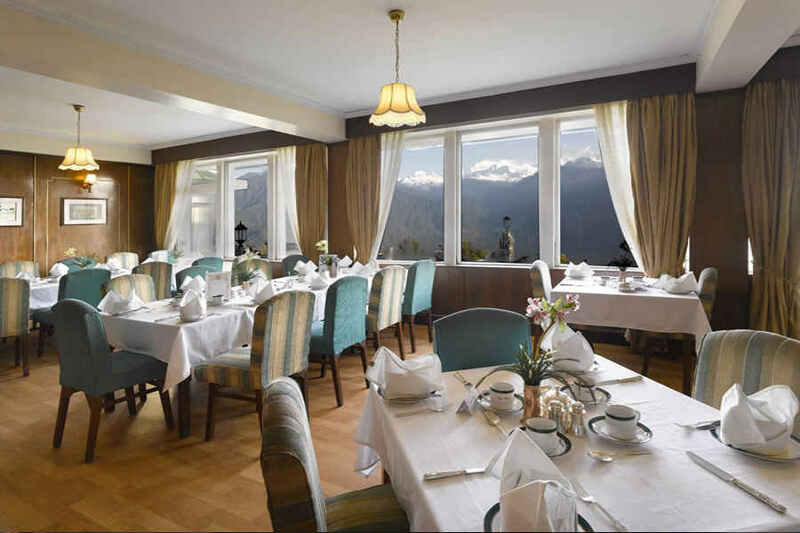 Dine like royalty at this Classic Mountain Resort at Pelling as discreet stewards serve you and the tinkling notes from the grand piano keep you company. Indian, Continental, and local Sikkimese cuisine feature on the menu with freshly baked pastries, cakes, and bread being the highlights of every breakfast. The elegant dining room, garden gazebo, and lounge are also great spots to enjoy some flavourful high tea. Traditional Nepalese dance performances are held regularly at the resort and you can also join in. Horse rides, nature walks, and a game of chess can all keep you occupied at this stunning resort. 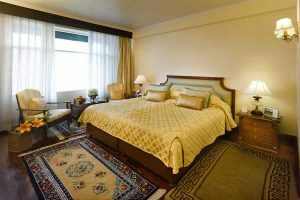 There are 30 comfortable and spacious rooms at this Classic Mountain Resort at Pelling which are categorized as Deluxe Rooms and Suites. All of the rooms have been decorated in pleasing colors and feature Burma teak floors. The rooms all offer lovely views of the gardens or the Himalayas and the bathrooms all feature a bathtub. So pack your bags and set off for this getaway in the lap of the majestic peaks. Reserves the right to change the room rates and policies without giving any prior notice. Applicable taxes are subject to change as per the amendment of Government Laws. A proof of identity at has to be presented at the time of check-in. Guests are requested to carry with them the required document during their travel. Confirmed days may be altered and canceled 30 days prior to the check-in date. Intimation must be given in writing. Full stay will be levied for cancellations received in writing within 15 days prior to the check-in date. Simply relaxing and doing nothing but gazing upon the majestic Mt Kanchenjunga or the other peaks is something that you will want to do all the time while at this resort. 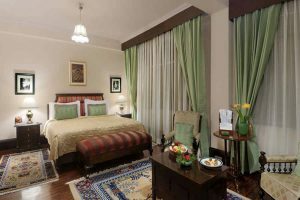 Trekking across the different trails, going on horse rides across the verdant yet undulating terrain, or a leisurely nature walk are all some outdoor activities that await you at this resort. 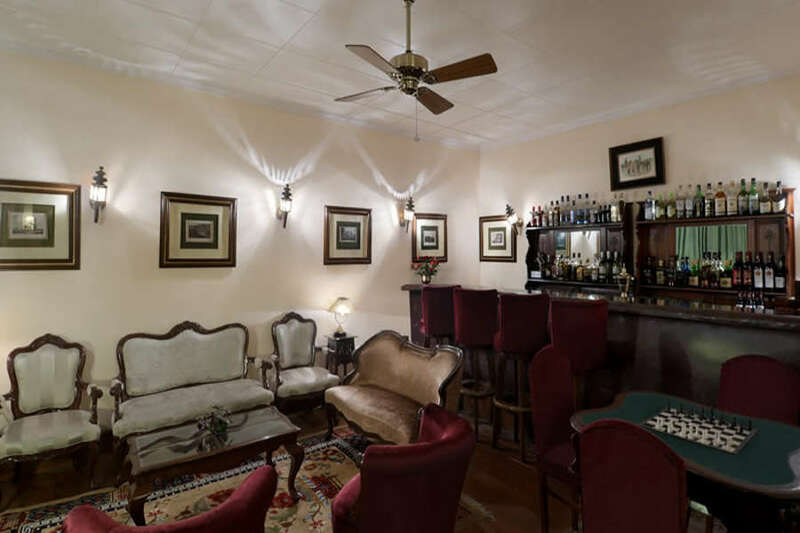 You can also enjoy a challenging game of chess or simply explore the grounds of the property. The opportunities for photography are plenty and it is best to keep your camera with you at all times. The renowned Pemayangtse Monastery is just a short walk away from the resort and is a must-visit while you are here. Sidkeong Tulku Bird Sanctuary is worth a visit if you are an avid bird watcher or a nature lover. Singshore Bridge, Darap Village, Rabdentse Ruins, Sewaro Rock Garden, and Kanchenjunga National Park are some other places of interest if exploration is what you seek. Bagdogra Airport is the nearest at 137 km while Netaji Subhash Chandra Bose International Airport, Kolkata, is at 683 km. Indira Gandhi International Airport, New Delhi, is 1573 km away. Siliguri Junction is the nearest railway station at 126 km while New Jalpaiguri Junction is 132 km away. Kolkata Railway station is 680 km away while New Delhi is at 1565 km. Darjeeling is 67 km away via Nayabazar-Legship-Reshi Road and Darjeeling-Jorethan Road while Kalimpong is 87 km along Nayabazar-Legship-Reshi Road and Melli-Nayabazar Road. Gangtok is 126 km away along NH10 whereas Kolkata is 668 km and New Delhi is 1569 km away.